One year on and we’re still here, on the road. This is no longer ‘Ellie and Adrian’s big trip’, but our way of life. It’s what we do. For now. We guestimate at 40,000km across eight countries and counting. Our odometer died for a time between Portugal and France, and then again in Sicily … and it’s still not working! We’ve slept in 167 different places, from the dirty floor of a Tunis-Palermo ferry to the pristine wilderness of the mountains. We still haven’t found the perfect official campsite, but Etna Wine and the ‘duckling’ farm south of Rocamadour in the Dordogne come close. The joys of digital mean we’ve taken more than 16,000 photos. Yes, we are ‘managing’ them, but we do need to edit them down a bit. Back in January 2011, when we bought our red van, we were embarrassed by its size – it seemed so big and shiny. We’d always camped in tents before, so it was the height of luxury, warm and dry. 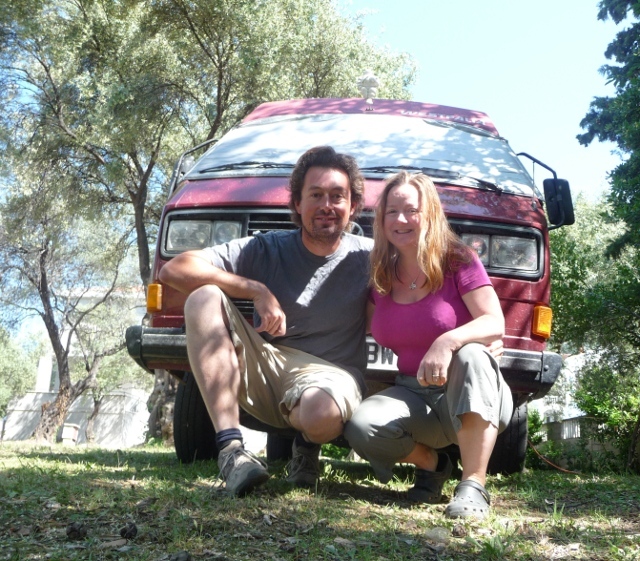 When confronted by the giant white and silver beasts of motorhomes on the Continent that we soon dubbed ‘fridge freezers’ we came to realise that our van was anything but big. It is small and perfectly formed though and with a very few exceptions for a van of its ripe old age of 24 years, it has carried us safely for many miles. 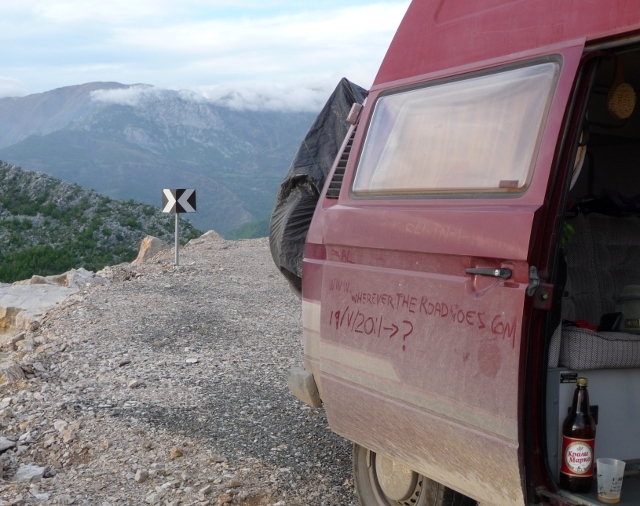 We’ve driven it hard too, over ranges of mountains from the Pyrenees to the Alps, the Appennines to the roughest roads of the Accursed Mountains of Albania. It’s met snow, the spray from crashing waves and the desert sands of southern Tunisia. It’s been lost up narrow cobbled streets all but taking people’s washing down. It may not have air-conditioning, a bathroom or a drop down coffee maker, but we can take it down all the tiny less travelled roads we love so much, park in the middle of villages or cities, and that’s exactly what we wanted from it. Oh and by the way, it’s far from shiny now, wearing its travel dust like a badge of honour. What are the best things about the trip? We have deeply appreciated the spirit and generosity of the fellow travellers we’ve met along the way. Sharing information and stories, socialising until the early hours, or having an impromptu lunch or a coffee together in a layby. It’s kept us sane and kept us on the road. Having contact with so many charming people in the countries we’ve been to and realising that not having any common language need not be a barrier to friendship and offers of help, as well as getting a precious glimpse into other ways of life. There’s so many people and cats we would have gladly welcomed to travel our road with us. Seeing the most wonderful places that the world offers, nearly every day. New experiences at every bend in the road and discovering new foods and drinks. Travelling with the freedom of the open road, wherever it goes, and hardly ever knowing where we’ll be spending the night. We are fitting the pieces into an enormous jigsaw puzzle of world cultural history, from pre-history to the present day. It is fascinating to see the influences from different civilisations and spot connections between different nations, languages and customs. Our language skills have improved considerably and we are regularly practising our French and Italian, and I have even dusted off my ancient schoolgirl German. We have used all the Finnish words we ever knew, and have learned some Arabic, Albanian and Serbo-Croat. We have better miming abilities too. We’ve learned that being able to say just a few words in the local language opens doors and wins hearts – a really rewarding result. We have the power to change the weather simply by putting a load of laundry on. The length of time it takes to navigate out of a town with no signage, is in direct proportion to how much we are longing for our picnic lunch that we promised to have just after we got clear of said town (Avellino, southern Italy we remember you well, and so many others). We’ve become more aware of what we consume, particularly water. Do we miss anything from home? We got over missing things a long time ago, but a pint of bitter and a good roast dinner now and again wouldn’t go amiss. And oh how we’ll appreciate the washing machine when we get home too. Thank you to all the family and friends who’ve acted as post-people – getting important things to us by courier, mail or in person. Thanks to friends old and new who’ve put us up, helped us when we broke down, got stuck in the mud, or the sand, or ran out of wine. Thanks to everyone who is following our blog – it’s great to have so many vicarious passengers along for the ride. We love writing and illustrating it and your comments and greetings give us the encouragement to continue to do. Don’t be shy, introduce yourselves – we would love more comments. Special thanks to Matt and Berenice, who are renting our house and valiantly holding the fort, checking the mail, dealing with the boiler and overflowing drains, and keeping up appearances with the neighbours by ensuring there’s a surfeit of unusual cars parked out front. In fond memory of Gerald and Gunnel, without whom none of this would be possible. This kind of travel is joyous and intense. So many impressions in one day make the time expand and contract in strange ways. The highs and the lows are more keenly felt. We have no regrets and we appreciate every day we’re on the road. Well, except when it’s tipping down with rain, the van’s leaking and full of laundry that won’t dry… those are the times when the van seems really small and it’s all too easy to add to the low mood when glasses of wine are so easily spilt. The highs more than make up for that though, and you can always pour more wine. The marvellous thing is that we’re still on the road together, all three of us … and we haven’t woken up with a start to find we’ve dozed off on the tube and it was all a dream. We’re really living that dream, and we’ve hopefully still got a good few months of travelling wherever the road goes to come. I loved this post. I came across your blog by reading someone else’s. I then went back and started at the beginning -reading about all those boxes of books heading to Oxfam – and kept reading until I have caught up. It is wonderful that you have followed your dream. Completely re-evaluated your life and the usual issue with belongings. Congratulations on your year on the road. I have enjoyed travelling with you. Long ago I did something similar in Australia. I took like you lots and lots and lots of photos – pre digital! I would keep all those photos, even the ones that are double and triple copies of photos. Each one represents a moment in a momentous trip. Welcome along for the ride. We’re frankly amazed – and delighted – that you’ve managed to plough through the whole lot. Oz is a wonderful place, isn’t it? Ellie spent a year there, in a previous life, and I’ve spent a bit of time there too. Of course, Paul H (who’s also commented) might disagree, since he’s from that other bit just off the coast of Oz… And, yes, Paul, we may well get around to you at some stage – but there’s a lot to see between here and there, and some of the roads are a bit waterlogged. Oz is indeed a wonderful place. Like Elle I was there go a year and only came back because of my visa. Then somehow life took over job, career, husband mortgage & 20 years later a sudden awareness that we only live once so following our dreams is important. All that, and you’ve not made it anywhere near the southern hemisphere yet! One day, one day! Enjoy keeping up to date with your travels – mostly at work! Adrian needs a hair cut ! I’m always pleased when another of your pieces pops up. I’ve followed every one and love them. Keep going – keep posting. 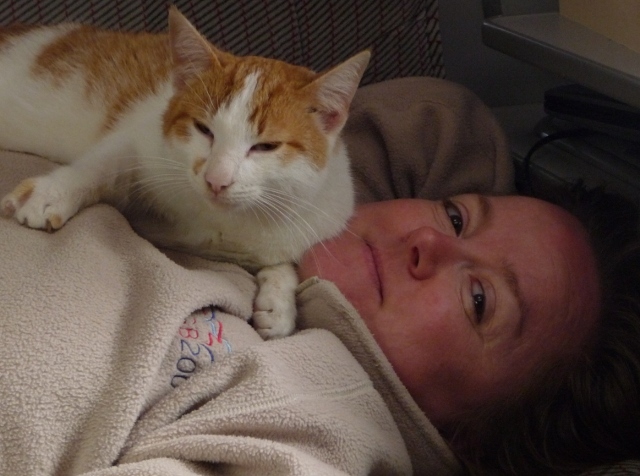 I’m just pleased that you haven’t included all 14.000 photos – though extra cats will always be welcome! happy anniversary! love the blog. enough of the cats already! more lizards! Still loving reading this, you may need to head back to the UK come October next year though ….. I can’t believe its been a year. Love reading about your adventures. So where next? China? Scandinavia? Good question! We’ve met so many people on the road who’re on the way to or from amazing places that we’re having serious trouble deciding. Get yer fookin’ hair cut lad! Better still, leave it and we’ll have a charity whip round the next time you’re in Blighty. A pound a snip, bring your own shears. Your blogs are a highlight when I’ve had a hard day at work… I read it and dream! A few more years to go and we hope to follow in your footsteps with the Land Rover. Sometimes takes me a week or two to catch up with them, but I never mis reading one. Little Louis (not little any more) was 17 last Saturday, so we covered 400 miles over the weekend with him driving his red 2cv! Passed theory this week, so gues he will be off to the camps on his own very soon now. We left the UK in October, novices compared to you, and are working our way east for now. We’re going until we run out of savings, then it’s back home to do something – not sure what yet. So many of your observations above made me smile, I can certainly relate to them. Looking forward to reading where it all began and working our way through your posts. We’ll keep an eye on your direction as our paths may cross at some point – it’s a small world with so much to see and do. And hello to you, too! We’re on Murter at the moment, heading slowly towards Zadar and Rab. If you’re coming this way, then it’ll be great to meet up. Take care, and safe travels. Hello both! Congratulations on a year on your travels! I love to read your posts when I can, a little bit of escapism from our more conventional life tied as it is to school runs! I have learned a lot by reading and seeing your splendid photos. I really want to go to Tunisia now among other places! Here in England we are having the wettest summer in history with many folk being flooded out and lots of events being cancelled due to mud/flooding. The ICCCR is to take place next month in Yorkshire so we are all doing our sun dances! It’s been a big year in the UK with the Queen’s Diamond Jubilee, lots of communities held events in the rain. The Olympic torch is touring the UK in the rain, and the Olympics start in a fortnight. In the rain? Janice, Neil & the (big) kids.